Sampaoli called up a relatively unknown name in his squad full of stars for Argentina’s upcoming friendlies against Italy and Spain. It was Independiente’s fullback Fabricio Bustos who made his debut for The Albiceleste. The 21-year old defender gave up a solid account of himself and could well be on his way to the World Cup this summer. We at ESDF Analysis take a look at his background and style of play. Born in Ucacha, Cordóba, Bustos started playing for his local side Jorge Newberry. It wasn’t until the age of 12 when he got recognised for his talents. Some trials let to a transfer to one of the Cinco Grandes in Argentina: CA Independiente acquired his services. He left his home and family and travelled almost 600 kilometres up north to achieve his biggest dream: Become a professional footballer. Despite his looks and somewhat aggressive playing style, Bustos is actually one of the most humble players around. Los Bustos were never able to afford great luxuries. They formed a humble man who knows where his roots lay. He often uses his spare vacations to visit his family in Ucacha. His father sells cheeses and other foods in his local village while his mother used to be a baker. Bustos never earned an easy route but he fought hard for his chances. He was tested even more when he ruptured his cruciate ligaments right before the U17 World Cup. He missed out – an extremely bitter pill to swallow but Bustos fought hard as he’s done all his life and made it back onto the pitch to resume chasing his dream. However, another blow was around the corner as he torn his meniscus right before he was about to debut for Independiente’s first team. But now, 25 domestic games later, Bustos has made his debut for the Argentine national team in a friendly against Italy. It showcases his impermeable will to succeed and his determined personality. Fabricio knows where he comes from and works hard every single day to achieve his dream. His work ethic also translates onto the pitch. Nicknamed El Tractor, Fabricio is able to run up and down the flank for the full 90 minutes contributing to the attacking phase as well as fulfilling his defensive tasks. His sheer pace makes him a constant menace down the right flank. He also reads the game well and chooses his moments wisely to contribute in attack. He’s the perfect modern fullback. Bustos has the ability to cover depth with his imposing pace. It’s an asset to any backline and useful for teams who like to play with a higher defensive line. His tackling is superb although he can sometimes lose his head a little. He’s determined, brave and relentless in defence. He’s got that ‘over my dead body’ mentality that makes him unstoppable at times. His ruthless tackling is also useful going forward when pressing forward. 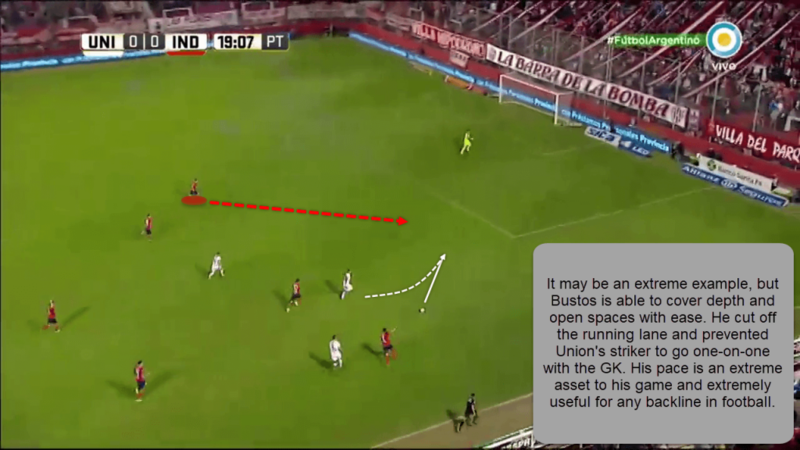 Bustos often wins the ball back high up the pitch due to his eagerness to win the ball back at all times. As mentioned Bustos’ awareness is key in his game. He knows where the danger lays and isn’t afraid to take risks to shut it down. In the situation below we can see a Millonarios having a numerical advantage in the centre of the pitch. The nearest Millonarios striker does a stepover which sees the ball reaching the second runner who would’ve had a clear-cut chance if it wasn’t for Bustos. Bustos is a constant menace down the right flank, often contributing to the offensive phase of the game. He either creates a numerical advantage with his overlapping runs or offers a passing lane with an underlapping run. The latter was key in the situation below. It’s not only over/underlapping runs that he offers though. Bustos is a great dribbler and often goes on mazy and adventurous runs down the right flank leaving multiple opponents behind. Fabricio is also a decent passer on the ball. Both his short, as well as longe range passes, are usually accurate. 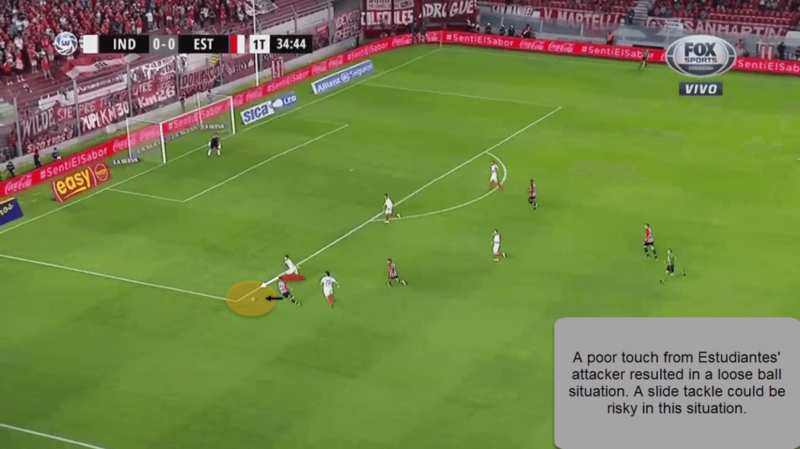 This often sees him playing through balls to feed the vertical runs of his teammates, which has been a key aspect under Holan’s Independiente. The 21-year old fullback isn’t the tallest of players at just 1.67m and can be beaten in the air. His short figure may suggest him being weak but his determination, work rate, balance and mentality well make up for this. He’s a warrior and doesn’t give up easily. His eagerness can however sometimes lead to overcommitment. This, in turn, could lead to an unnecessary booking or a huge gap in defence. The future looks bright for Bustos. He’s been linked with a move to Bayern Munich and could well end up in Europe after this season. He should be an absolute no-brainer for any European team as he possesses all qualities of a modern fullback. Bustos may also be Argentina’s solution to their eternal fullback issue. With his counterpart and ex-teammate Tagliafico on the left, Argentina finally seems to have solved their weakest area. The ex-Independiente pairing should feature for Argentina in their quest for success in the upcoming World Cup this summer. All in all, Bustos looks to be one of the most promising defenders in world football and he’s definitely one to keep your eye on this summer in Russia.